MICROSOFT'S Surface Pro 4 is something of a strange device. Too heavy to be a light-weight tablet but not comfortable enough to replace your laptop. 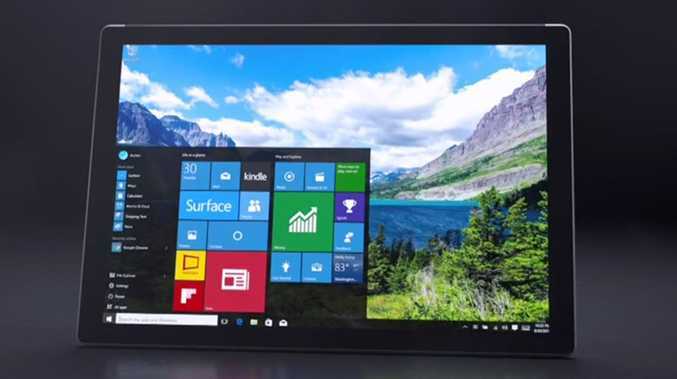 Microsoft says the Windows 10 device is thinner, lighter and faster than any Surface Pro. And based on the last few months of reviews, including from customers, it's certainly winning plenty of fans. It has a brilliant 12.3 inch display. One of the best of any tablet or desktop around. It's a device on which you can easily watch a movie in bed. The device we tested had plenty of grunt. Its keyboard is super flat and easy to use. Very similar in many ways to the best keyboards that Apple offers. But as some point out, you fork out extra for it. Microsoft says the new 6th Generation Intel Core i5 and i7 processors run quieter, cooler and more efficiently than the Surface Pro 3 which overheated. Battery life is a bit of a problem. Many report you are lucky to get six hours out of the device. There are some decent power-saving features built in. As someone who is still new to Windows 10, I found the Surface Pro 4 a great way to explore the new operating system. Anyone accustomed to touching icons on an iPad, for example, will find the new-look Windows 10 very familiar. And of course, you have all your favourite work tools available including Word, Excel, Powerpoint, Outlook with easy options to share your projects between colleagues and your own devices. One of the selling points is the Surface Pen which allows you to write notes on your screen during meetings, draw, colour in, or even write on web pages using the nicely long overdue Microsoft Edge browser. The pen, which clips on to the side of the device using a magnet, has 1024 levels of pressure sensitivity making it both accurate and versatile. You can also use it to access Cortana, Microsoft's personal digital assistant with the click of the button. 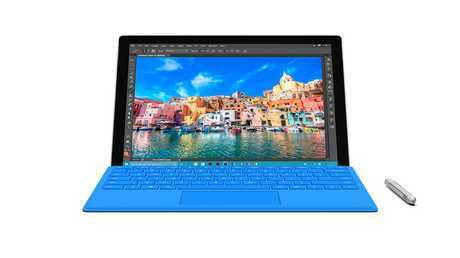 The screen is probably what is winning the most rave reviews for the Surface Pro 4 - and rightly so. It features a 3:2 aspect ratio which makes for very comfortable viewing. It is a device you can work on for an extended period of time without suffering as much eyestrain as you may with an inferior display laptop. Display features five million pixels, 2736x1824 or 267 pixels per inch and a 1300-1 contrast ratio. While the device works great as a laptop on a desk, I found it a little more awkward on my lap. With a pretty robust magnesium body, the Surface Pro 4 is something you could easily throw into your bag as you dart between meetings. The devices come in 4GB, 8GB or 16GB RAM configurations while the solid state drive storage ranges from 128GB to 512GB. It comes with a Windows Hello face-authentication camera at the front, an 8 megapixel rear-facing camera with 1080HD capability at the back. Ports include a USB 3.0 port, mini display port, micro SD card reader and stereo headphones and microphone jack. It may not be a laptop killer yet, but it's pretty close.